The same great Moby but even lighter! The midweight option is great for wearing your baby in all seasons. The Moby Wrap is the favourite newborn carrier. Newborns have a unique desire to be close to their parents and this stretchy wrap makes it easy and comfortable. Studies have shown that keeping your infant in close contact regulates body temperature, soothes fussiness and helps to create the close bond that all infants need. 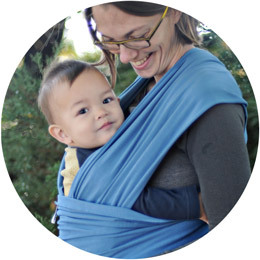 The Moby Wrap allows parents to provide infants with the closeness they need while also allowing busy parents free hands to tackle the rest of their daily lives. The wide fabric, when wrapped, spreads over both shoulders and across the back to evenly distribute baby's weight. The Moby Wrap can even be comfortably worn for long periods of time. It can be worn all day while taking your infant out and putting them back in with ease with only a few minor adjustments required. ONE SIZE truly fits all. The Moby Wrap is a wide, long piece of stretchy fabric so the size is completely adjustable for any size adult or infant keeping your baby completely supported in a comfy cocoon. The Moby Wrap is not only a great newborn baby wrap; the durable fabric can comfortably hold babies 8 to 35 lbs. The Moby Wrap can be used in several positions the Newborn Hug Hold, Hug Hold, Hip Hold and Kangaroo Wrap & Hold. Practice in front of a mirror first until you feel confident putting on the Moby Wrap and placing your baby with it. After a few tries you'll notice that putting on the wrap becomes quite simple. Carry your baby the same way as you would if carried in your arms - supported, snug and aligned. Your baby and you will love the Moby Wrap! Each Moby Wrap comes with an easy-to-follow full-colour instructional booklet containing wrapping instructions and safety information, or go to http://www.mobywrap.com/instructionpages.aspx?Topic=mobyinstructions for complete wrapping instructions. Moby Wraps are made of soft 100% natural cotton (If you are looking for an organic baby wrap, try our Moby Wrap Organics). You can easily wash your Moby Wrap in cold water and tumble dry on low. View our entire selection of Moby Wraps.